Today, I thought I’d take some time out and write up a bit of an ‘old school’ type post.. One where I share with you all of the going-ons that have been happening in and around my sewing room! Just like the good ol’ days!! First up, I’ve been spending my down time making this quilt for a friend of mine who recently celebrated a very special birthday! (I’m saying no more on the subject, just incase they read this blog!) Typically, I missed the deadline of their actual birthday to have this quilt finished and gifted to them, but you know, better late than never! I found the inspiration for this one on Pinterest (where else!). The picture hit me straight in the face and I knew instantly it was perfect for this occasion! 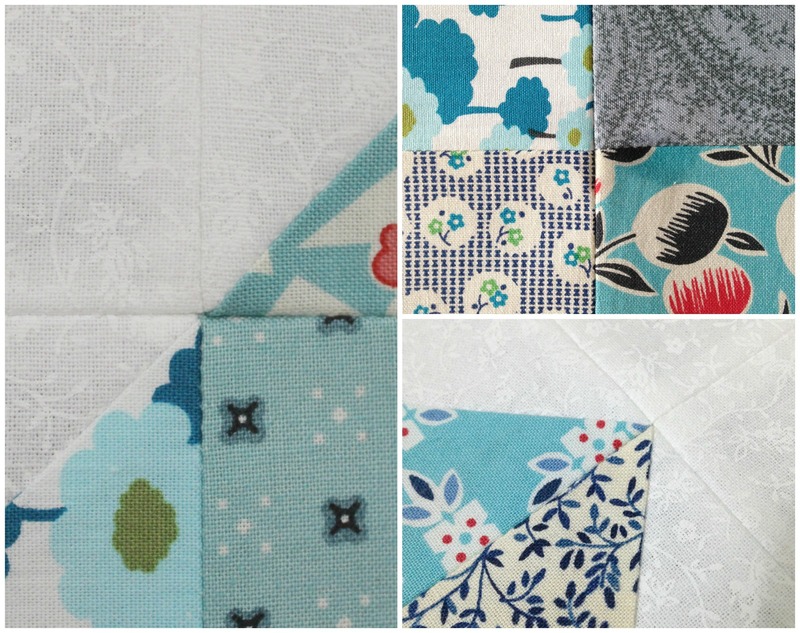 The recipient of this quilt loves the colour blue, so I riffled through my stash and found a mish-mash assortment of beautiful blues and mints with a mixture of prints, directions and values that would help add interest and movement to the quilt. I then paired these with a crisp white-on-white print fabric that make all of the blues pop and sing! All up I think I made about 120 5″ HSTs… I do love making HSTs but sometimes the monotony of trimming can be draining and painful! But after numerous cutting, piecing and trimming sessions, the time came to place the squares into place onto my design wall. I did this with no particular plan. I simply just placed them up ensuring similar prints and colours weren’t placed too close to one another. This did take a lot of back-and-forthing to ensure everything was working harmoniously! The way I chose to piece the quilt top was an odd and very laborious one. I literally pieced the quilt top together one square at time… What I did was divide the quilt into quarters, pieced each one together and then brought them all together to complete the quilt top! It may not seem that tiring, but by doing it this way, I was forced to press every single seam on the back flat open! It wasn’t fun and it slightly took away the fun and excitement of making this quilt. But hey-ho, I pushed through it and got it completed about two weeks past its due date! Oh dear! However I must say, by doing it that way, I had so much more control on getting the points of the triangles sitting perfectly together! I don’t think I’ve ever been able to get such perfect point matches and seam nests/joins in any other quilt I’ve pieced! Some of these beautiful joins just simply take my breath away!! So now I have the quilt top hanging to the right of me whilst I find the perfect backing for it and muster the enthusiasm to baste it! I’ll keep you updated once I’ve basted it and starting the quilting! I purchased this embroidery pattern from Urban Threads – a great online source of modern and quirky embroidery patterns and ideas! Another thing that’s been revolving and considered in my sewing room is the decision to open my own Esty store! I’ve sold things I’ve made online before – for quite a few years actually – but wanted to find and use a new platform that would be and is more accessible to international shoppers. From what I’ve heard, Etsy has a pretty good reputation and is trustworthy and well known worldwide, so I thought I’d give it a go and see what happens! At the moment, I haven’t anything for sale yet as I’m still at the planning stage of figuring out shipping rates, packaging and what it is I actually want to sell in my shop. I have a few quilts that I’ve made (or are half made atm!) 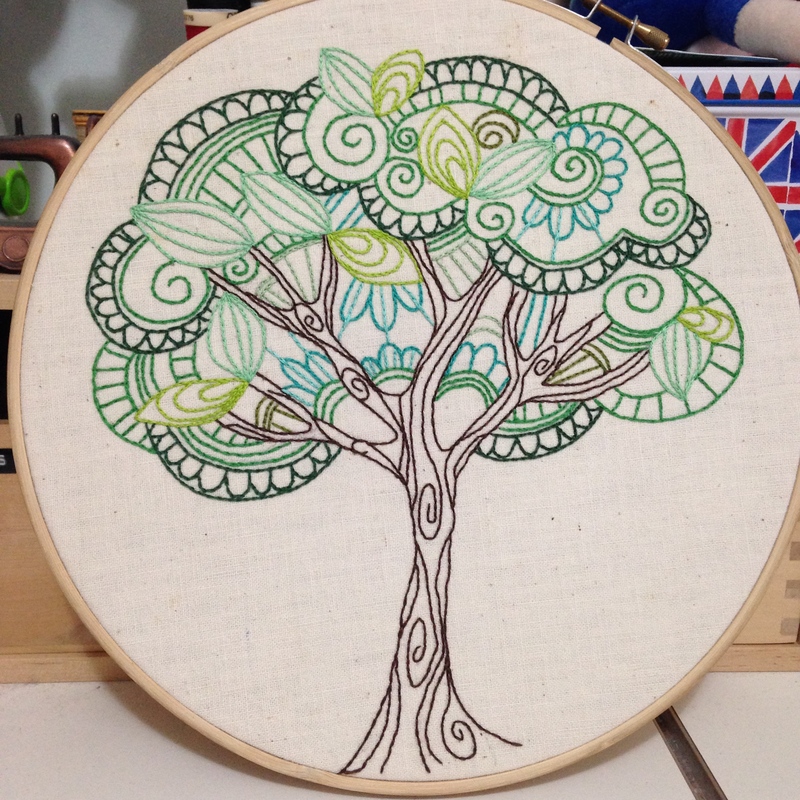 that I would like to sell as well as some embroideries (possibly framed; still figuring that out!) and a few other things that I’ve made in the past that have sold well. Ooo!! Exciting times are ahead here in Sydney! The craft and quilting communities are getting ready for the Craft & Quilt Show to open next week!! Wheee!! This is like our version of QuiltCon or Quilter’s Market, where you get to explore, buy and be inspired by what’s new in the crafting and quilting worlds! Also at the show they have the Sydney Quilt Show on where they display all of the quilts to be judged for Best in Show and other awards for 2015. I’ve entered in quilts over the past two years, but decided not to enter this year for a few different reasons. But I’m excited to see what the quality is like this year. The quilts last year were the best I’ve seen yet! 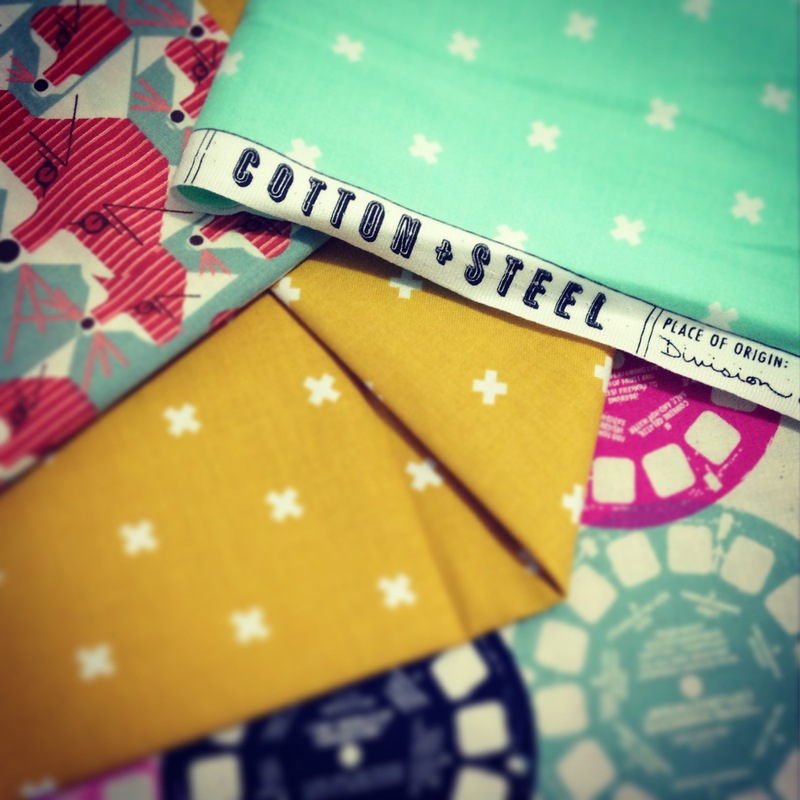 And speaking of quilts and fabric and all good things, I recently went on a bit of a splurge on one of my favourite online fabric stores, Kelani Fabric Obsession! Every time I click onto that website, there’s always something new and beautiful to tempt me to buy and I sit there trying to justify why I need it in my life! This time around, I did have a few good reasons why I needed to purchase some new fabrics… The first is a commission to make two gender-neutral baby quilts for a friend who has two girlfriends expecting! I love, love, love making baby quilts, so I said yes and immediately began planning what I would make! So half of the fabric I bought are to use in those two little quilts, while the rest of the order is to be used to make some special projects for my Esty shop! I’m so excited to get into them and get making some beautiful things for you all! Oh, and I almost forgot! I uploaded a ‘Haul’ video on my YouTube channel over the weekend showing you everything I got!! If you would like to watch that, click right here! And finally the last thing I wanted to share with you is something I saw on Instagram this morning. It was a pledge created by Amy Gibson from the blog, Stitchery Dickory Dock. Called the ‘The For Keeps Pledge’, she encourages us quilters to pledge to keep the art of quilt making joyful, soulful, non-boastful and enjoyable! To see the pledge in full, click here to go to the blog post she wrote about it! I think it’s such a great concept for all quilters to focus on and work by, especially for me as I share so much of what I do online and with others. Your tree looks awesome!! What did we do before Pinterest for inspiration?!?! ; ) Keep up the amazing work! Love your blog. Just found it a few months ago. Have you heard of Missouri Star Quilt Co? Jenny does quilt tutorials on YouTube and has an easy way to do HSTs. Love the quilt you made for a friend. My favorite colors. Thanks so much for your comment! The quilt in question is still waiting to be basted and quilting! I’ve had many requests to do a tutorial on how to piece/make this quilt! So yes, I definitely will be! 😊 I’ll keep you updated on my blog of when to expect it! QUILT DESIGN WALL! styrofoam insulation sheets from a home improvements store, flannel holds best (even an old flannel sheet from a thrift store that has little or no pattern on it) or muslin. In my old house I had sliding flat closet doors that I used muslin and good old duct tape to wrap them… but an insulation sheet can be very portable, 4X4, 4X8, and they slide behind the room door when not needed. Also have seen great ideas with pull down shades that have been covered in nappy fabric. One had a wooden valance so the pull down shade was hidden when up, but the valance doubled as a display shelf. Thanks so much for sharing your wonderful ideas and thoughts! I never thought of using styrofoam sheets as a portable design wall… It’s such a fabulous idea! I love hearing about how other quilters approach a project. I agree with you trimming HST can be so boring and definitely painful. How long did the piecing take you? Fun to see your quilts. I just did the pledge last night with Amy. I can’t wait for her book to come out I love all of her stuff. I have to agree with you about half square trimming! That’s great to know! I think the pledge is such a wonderful concept to help keep us quilters grounded and in it for the right reasons! How do you make your design wall?! I’m interested in having one but have tried googling and have come up a little short. Is it just like, a big [read HUGE] piece of batting you tacked to the wall? Also, I have never heard of QuiltCon and it sounds very intriguing! I love finding people’s quilts on instagram and pinterest — I will have to look into perusing pictures of QuiltCon! Excited to see all you have to offer in your etsy store! Yep! That’s exactly what my design wall is! A huge piece of batting tacked to a wall in my sewing room! It’s the best thing ever! Perhaps do a search on Pinterest, you may find more inspiration/information there. QuiltCon is like a huge quilting conference that takes part in the US every year! (I think it used to be every second year, but changed it to yearly quite recently.) They have all the big names in quilting fabric ranges, designers and makers as well as a huge quilt show! I would love to go one year, but it’s expensive and a very long way to travel to from Australia! 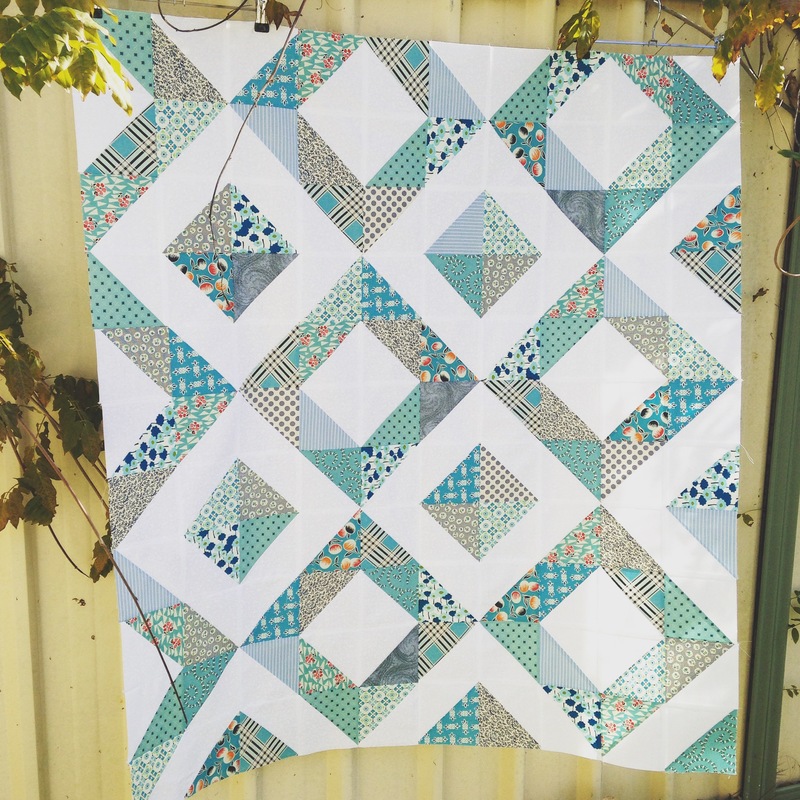 I simply love the blue & white quilt top you made … and those joins!!! they’re amazing! the Craft & Quilt show sounds like a lot of fun. I’ve checked out QuiltCon online but not ready to splurge just yet 😉 I have an etsy shop but there’s not much in it. I just started with two of the quilts I made in the last few months. Good Luck with yours, I can’t wait to check it out. Thanks so much! I’m taking a trip into my local fabric store tomorrow to buy some batting and backing fabric for the quilt. I can’t wait to get started on quilting it! Nice update. 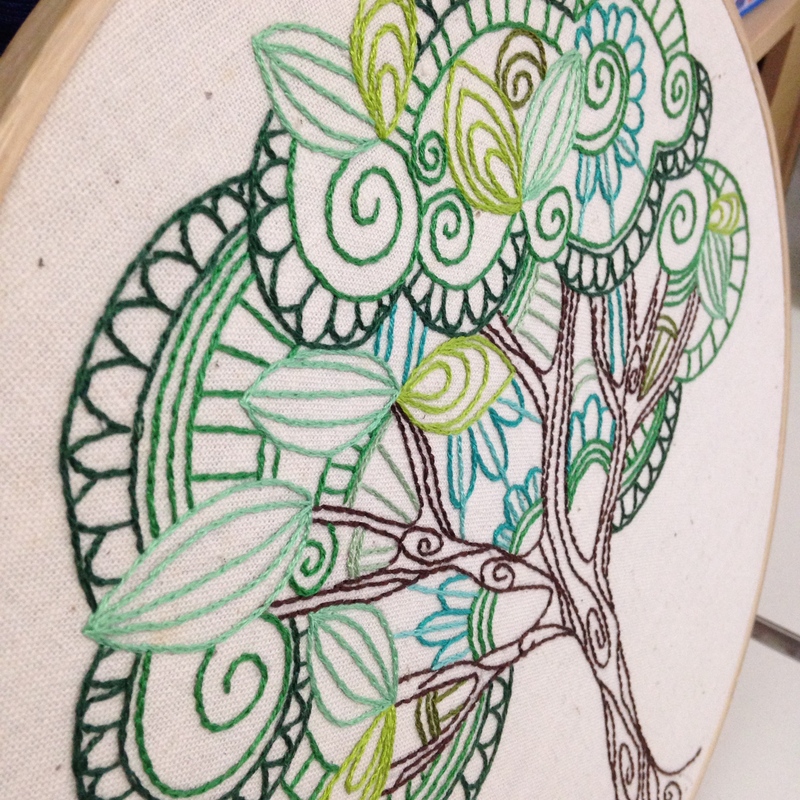 Love the tree embroidery.